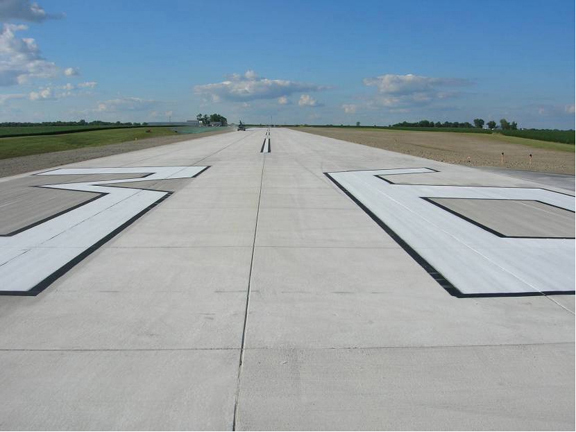 Project obstacles and solutions: The Delphi Municipal Airport was built in 1970 and its asphalt runway 18-36 had been patched a number of times. In 2008, with the help of NGC Engineers, a plan was devised to reconstruct the 2600' x 60' runway. Several ideas were considered, but based on cost and time, it was decided to use an unbonded concrete overlay. The old asphalt surface was used as sub-base. This required a new drainage system along the edge of the runway. The asphalt was cleaned and cracks in the old surface were filled with sand to stabilize it. After this, six 1300' x 20' concrete sections were paved over the surface. IMI was able to deliver over 2,700 yards of concrete in six days of paving. The project was completed in 38 days, one full month ahead of schedule. By using a concrete overlay instead of asphalt, the project came in 22 percent under budget.